Hi everyone, I am about to build my smartcore as my second ever printer (have a QUBD Two Up). I am using the openjscad tool to generate my printed parts - it's such a great concept for customisation! I have chosen a build volume which corresponds to all the smooth rods being 300mm. I'm using 18mm mdf (the glue is drying as I type). If you're in UK I can't recommend the B&Q free cutting service highly enough for straight, square, millimetre-accurate box panel production. Just buy a £15-20 sheet from them and they'll cut your box rectangles. 2) did you guys print your parts in PLA or ABS? 3) What perimeter counts, infill % etc did you use for appropriately strong parts? I used ABS. I think 30% infill would work for most parts, but the Y motor/rod holder I would bump that up past 50%. I might reprint mine at 80% or so. With 8mm rods it's pretty thin. @madmike8, thank you very much. What number of perimeter layers did you use? I haven't attempted ABS yet as I have been printing in the house. It's mild enough to move operations to the garage if I need to. What sort of ventilation setup do you use for abs? 3 perimeters on a .4 nozzle for me too. I followed the BOM and purchased the M8 x 25mm. If you prints come out fine, the screw will go into the mounts snug and stay there. Looks like it will still work. Great info guys, thanks. Snapped a small but critical piece of mdf in my 2 up extruder last night so am in damage control and resilience mode! I have had real trouble printing the little protruding rims around the 8mm 608 bearing holes. I'm printing it on its side because that's the natural orientation to print the other features but I end up with a lumpy or absent rim, leading to the bearing rubbing on the rest of the part. Did anyone print these parts with the bearing axis vertical and use support, or do I just need to get a grip of my settings? Slic3r shows the toolpath/material should be laid down, so it's a speed/acceleration/retract issue most likely. Interested to hear your experiences. I filed those off as they caused binding in the bearing. i really saw no use for those as the M8 screw holds the bearing in place. @rcjoseb, thank you for the tip - did you find that there was play in the bearing/bolt until you put the belt under tension or was the bearing firmly held in place without play before the belt was installed? I have filed down those rims and there's a bit of play (608 ID vs 8mm rod OD). Yes there is some play and I don't that is going to be a problem as far as i can tell. I am planning to use a Lite6. Same bracket/clamp dimensions AFAIK. Do you want my file for the mount? Apologies for not logging very well - I have started building. Has anyone needed to edit the configuration.h to change x and y directions to work with the home command on repetier host or a similar application? Does anybody know why temperature sensor 1 is marked as -1, a thermocouple? I bought the inductive sensor with the model number given in the Youmagine BOM and have connected the +v and ground wires as per the smartcore YouTube assembly video. With nothing else running, my multimeter reads 7.4V on the signal wire when there's nothing near the sensor and 5.7V when I put steel near it. The YouTube assembly videos and Youmagine BOM don't mention anything about a voltage divider but others do. I'm confused. Firstly I want to make sure I don't damage the RAMPS and arduino and secondly I want to make sure I can produce usable signals for leveling features. I'm using an ATX power supply which reads 12.2V at no load. Please could you guys give me your views or ask clarification questions which might be helpful to check? I'd especially like to hear from Serge about how he sets this up and uses it. EDIT: I looked at the YouTube video again and wasn't sure I got the signal/ground wires the right way around. Then I remembered some funny (funny to me, normal to electronics experts) behaviour my NPN mosfets had when I connect them up wrong (can you see a pattern emerging?!) and tried swapping the black (signal(!)) wire and blue (ground) wire. Got a lovely response and ranging from 0V to 12V. So, no more answers required for now but I'm intrigued about Serge attaching a 12V logic signal pin to the RAMPS and Arduino... Is that pin set to some tri-state where it is 12V tolerant? Then I looked at the arduino forum and this post. So I took my basic digital multimeter and checked the resistance on 20K, 200K and 2M Ohms settings. When the switch is open (normally) there was an out of range resistance reading on 20k setting, 130k Ohm on 200k Ohm setting and about 1M Ohm on the 2M Ohm setting. This is when the signal line is at 0V. Then I switched the mosfet closed to achieve the 12V on signal line and took resistance readings again. This time all readings were out of range, suggesting a huge effective resistance to current, meaning the Arduino could see the 12V but not receive a damaging current from it. DISCLAIMER: I'm just trying to understand the phenomenon APPARENTLY shown where a 12V logic high is shown to an Arduino digital pin. YOU PROCEED AT YOUR OWN RISK. Hopefully Serge will confirm whether this is what happened for him. Edited 2 time(s). Last edit at 05/07/2015 07:19PM by smerrett79. Just a quick post to show progress. Please don't ignore my plea for help in the previous post! This is my first smartcore, first build of a printer from scratch and my second ever. My parts are printed in PLA on my first printer, a QUBD Two Up. All rods are 8mm dia x 300mm long (designed for standardisation rather than a specific build volume). MDF is 18mm. As well as the points in my previous post, the Y axis endstop doesn't hit the stepper motor body. This might be related to the parametric CAD model but is easily overcome by screwing a protruding tab of plastic to the nearest stepper motor hole. Planning to add a centrifugal brushless fan for print cooling, perhaps on the back of the head assembly. Also planning to use another, identical fan to actively cool the stepper motor drivers. Would like to add x and y axis max endstops, but not a priority. 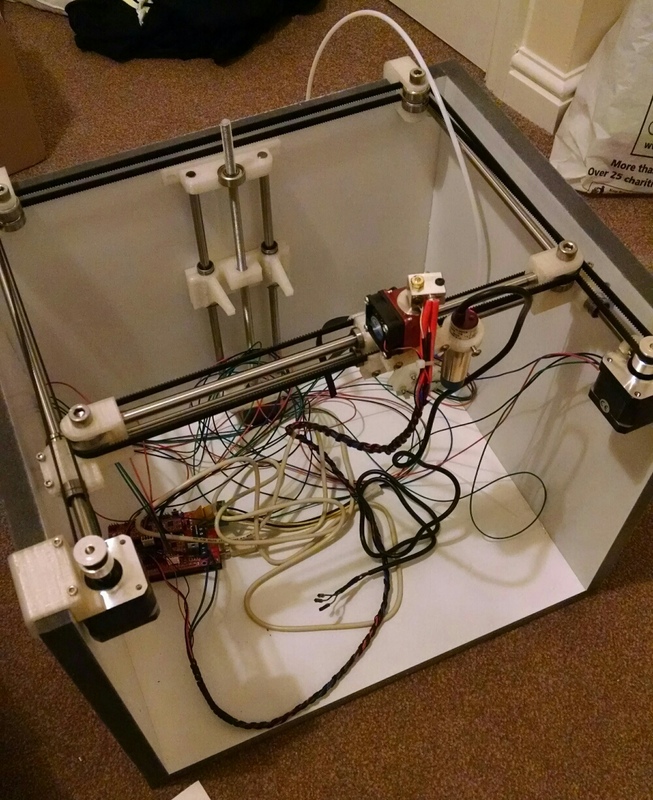 Thinking of mounting the electronics, PSU and extruder on the rear board, outside the build space, for clean looks, potential to encase the build space for abs printing without overheating the electronics. Planning to run off Octopi with webcam for remote monitoring and perhaps print initiation. LCD/SD card reader on its way. NOISE: this has potential to be very nosing while printing and I'd like to see if we can improve this. I have three approaches in mind, which may all help. I'll detail in another post. Jerry will probably chime in on the setup. You could just line then interior with cheap dollar store foam board, and use rubber feet to lessen the noise level. I will give the rubber feet a go - I had assumed that the 3x side walls were the most significant souce of noise but it's good to hear you've noticed an improvement. Thanks too for the stepper voltage tip - 0.25V seems low to me but I'll gladly try it. As for the hot end - well spotted! It was clamped upside down as it had just been through nozzle/block tightening whilst at 245*C.
Bump so you can read my edit a few posts above. I'm using A4988s with my RAMPS 1.4 bit turned the VREF down to 0.25V and it definitely makes a difference to noise - thanks! Haven't tried extruder or z axis under load but no skipping on x or y axes under manual commands/speeds. What's your concern over Bowdens? I think a belt version of my 2^1> could be a good way to go. make my printer run in the opposite directions. I could change this by setting endstops to MAX but this seems really strange. If I set the invert XY directions false, I get repetier host treating manual controls all in the right direction but GCode runs the opposite direction. I had an issue with the z axis direction for a while which has mysteriously disappeared. Finally, I had a go at including the G29 auto tilt compensation code in my start GCode but this gave wild z axis variation throughout the toolpath, fortunately once my z axis had erroneously moved 32mm too low as part of the first part of the G29 procedure so it didn't smash the nozzle and bed together. Has anyone had issues like me, would anyone care to comment on my attached configuration.h and is there another settings file, esp controlling the z steps per unit for automatic tilt compensation? Sorry for the lack of updates, this is a photo mid print. After struggling with adhesion to the aluminium Mk3 heated bed (working with 60*C and glue stick for the time being) I think I am getting some nice prints going. I routed the endstop switch and stepper cables through to the rear of the box, where I have mounted the RAMPS, extruder, ATX PSU and filament spool holder. I cut out some squares of carpet to attach to the sides to reduce noise but have found that leaving them in a pile on the bottom of the box does a reasonable job of this. I'm working on a duct for the centrifugal fan which distributes air a bit closer to the nozzle next. My plan is to make mounting brackets which fit to the hotend fan mount screws, so that it will work with multiple printers. I did try octopi but hadn't tweaked my settings well enough to live with the short delay between sending commands and having them executed. Might go back to it in a bit. There are a few print artefacts which I'd like to improve, such as slight ringing, stringing and z ribbing. Anyone got tips on the M8 threaded rod z axis and ribbing? I have tried using the Prusa step calculator but its still there. Going to increase retract to 3mm from 2mm to try and sort the stringing - already printing at 195*C hasn't changed much, down from 205*C. I reduced the acceleration in XY axes for perimeters but that hasn't really helped the minor ringing. I though that I had a problem with the extruder (lots of skipped steps when printing quickly). I looked at the hotend temperature graph in Repetier Host and it showed that the heater couldn't keep up with fast (80mm/s) printing. Following the E3D assembly instructions I had limited the maximum hotend heater cartridge heating current in PWM to 150 out of 255. Turning this back up in configuration.h to 250 out of 255 has pretty much eliminated skipped extruder steps. 8mm lead screw stainless steel and brass nut ( no Z ribbing now). ABS printing (hairspray, glue stick, 5-10mm brims, 60C bed and 240C hotend) - I must say the bridging ability and strength is impressive. Fumes are minimal - I've made a packing foam sheet hood to ward off delamination. Mk8 extruder gear - awesome! Unfortunately not compatible with the stock smartcore extruder and this one is a cracking one because it needs so few pieces of hardware (you can make the 608 bearing axle solid slightly longer and the 608 stays put without the bolt). No more chewed filament. Edited 2 time(s). Last edit at 08/05/2015 06:07PM by smerrett79. 1. Double z screw, mounted on the sides of the printer, under the Y axis rods. 2. 24v dc power supply for the heated bed (on order) which will be turned on using a solid state relay. 3. Smartcore V1.2 design to improve the rigidity of the x axis (rods are further apart) and the solidity of the print head (single piece rather than two pieces).